Ford Motor Company announced today that buyers of the sporty Focus ST and Fiesta ST will be able to attend the Octane Academy high performance driving school at Miller Motorsports Park where they will receive complementary driving instruction – giving owners a chance to unlock the full potential of their hot Ford hatchback in a safe setting under the watchful eyes of professional instructors. The Octane Academy began as a sort of reality show put on by Ford Motor Company will the help of some of the best known racers in the world including Vaughn Gittin Jr, Ken Block, Tanner Foust and Brian Deegan but beginning late this summer, the Octane Academy will serve as a specialized training program for those who have already bought a 2013 Ford Focus ST or those who plan to buy a 2014 Focus ST or the new Fiesta ST. Both the Focus and Fiesta ST were designed to be comfortable (and fairly efficient) daily driven vehicles that are also very comfortable on a race track so to show owners how great these cars are – and to teach owners how to best handle their high performance Ford hatchback – Ford will offer the ST Octane Academy at no charge to the owners of those models. The “catch” to this free program is that Ford Focus ST and Fiesta ST owners will have to get themselves to Salt Lake City Utah and cover their own hotel costs but Ford Motor Company takes it from there. 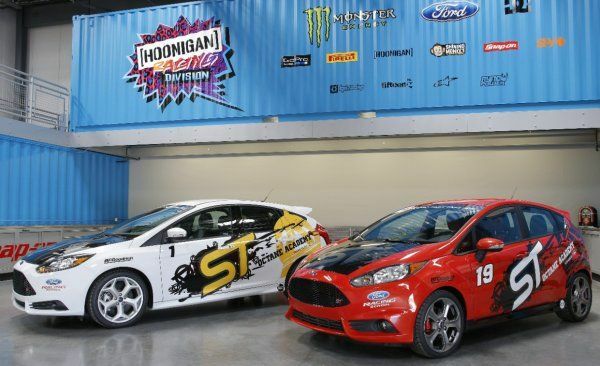 Upon an afternoon arrival in Utah, participants of the ST Octane Academy will be whisked away to visit Ken Block’s massive new Hoonigan Racing Division headquarters in Park City for a tour of the facilities followed by dinner and a reception event. No word on whether or not Mr. Block will be there but having seen plenty of pictures of the Hoonigan Racing Division HQ – I bet that it will be one awesome evening. On day two, the fun really begins as the Octane Academy attendees are taken to Miller Motorsports Park for a day of high performance instruction that begins with a “dynamic classroom session” followed by a morning of learned the best cornering, braking and car control techniques. After what will probably be a pretty nice lunch, the Focus ST and Fiesta ST owners will head back out to the track for lead & follow exercises, instructor ride alongs and hot laps with some unnamed pro drivers. Once the track program has come to an end, participants will receive a graduation package from the instruction team. The event ends with the ST karting challenge. In addition to the day of Focus ST and Fiesta ST high performance on-track driving, participants can also partake in another day of driving instruction that includes track time in the Mustang GT and off-road instruction in the SVT Raptor F150 with the folks from Miller Motorsports Park. It should be noted that the Mustang/Raptor instruction carries an addition fee but if you are paying to fly to Utah for a couple days for free instruction in the Focus and Fiesta ST models – why not spend a few extra bucks and rock out in the Mustang and Raptor? You can also pay to have an additional day of Focus ST and Fiesta ST instruction but the costs associated with the Mustang/Raptor program as well as the additional ST day have not yet been announced. So just in case the sheer awesomeness of these two hot hatches wasn’t reason enough to buy them – you will now get free professional driving instruction that will allow you to best handle your Focus ST or Fiesta ST in the highest performance situations.